Take Control of a Beautiful Helm. Provides a superior user experience across your entire network for radar, sonar and multimedia. GPSMAP 8417 large-format multifunction display features a 17-inch full HD screen with touch control. Sunlight-readable, anti-glare display is exceptionally easy to view and also includes auto-dimming feature for use in low light or at night. New maximum glass design enables you to experience a beautifully powerful, completely networked helm at your fingertips. In-plane switching (IPS) LCD display — an industry first for this class — provides consistent, accurate colors from all viewing angles. It also provides standard USB touch output for use as a touchscreen monitor for Windows® and Mac® operating systems. Install multiple displays with the industry’s lowest flush-mount profile or flat mount them edge-to-edge to create a sleek glass helm look. Quick, 1-touch access to the information you need makes boating easier. Full System Integration: GPSMAP 8417 integrates various sonar technologies as well as autopilot, connectivity, apps, engine data and multi-media. User data can be automatically synced for all networked networked 8400/8600 series chartplotters across multiple helms — everything you need is at your fingertips, all on 1 screen. A full digital switching system uses CZone technology. You can power up your boat while away from the dock, switch on pumps and control lights — even underwater lights. Nearly all of your controls are available right at your fingertips either at the helm or programmed into a remote key fob or an app on your tablet provided by CZone by Mastervolt. New High-performance Processor: Experience the fluidity of our fastest map drawing ever and enhanced video processing. Add up to 4 IP camera streams and simultaneous Garmin Helm™ support. In addition, all your added sensors, such as radar, sonar, multimedia and more, will benefit from the increased performance to provide a premium experience across your boat’s entire network. Customize Layouts with SmartMode™ Control: To make boating easier, GPSMAP 8417 includes presets for sonar, radar, cameras, media and digital switching, which can be independent or incorporated into SmartMode. With SmartMode control, you can quickly change all screens at a helm in sync to a preset mode, for example, fishing, docking, night cruising, etc. One-touch access allows you to switch all monitors in sync from 1 mode to another without manually switching each monitor separately. Fully customizable layouts, data and gauges allow you to place the information you need to see right where you want it. Garmin Marine Network and NMEA 2000® Network Support: Full-network compatibility allows you to add more to your boat. GPSMAP 8417 supports radar, autopilot, instruments, multiple screens, FUSION-Link™ entertainment system, sensors, remote sonar modules, digital switching, weather, thermal cameras, GRID™ remote device and more. It’s also FLIR camera compatible and provides SiriusXM support. View Multiple Sonar Sources Simultaneously: GSD™ 26 CHIRP professional sonar, GSD 24 advanced sonar, and GCV™ 10 or GSD 25 ClearVü and SideVü scanning sonar, even Garmin Panoptix™ all-seeing sonar, can exist on the same system. You can view various sonars together on 1 monitor or across multiple monitors in multi-display systems. Add Array or Dome Radar: You can add your choice of Garmin marine radar, including our powerful xHD2 open-array radars, GMR Fantom™ open-array radars with MotionScope™ technology or xHD dome radars that pair ease of use with advanced open-array features. Network Sharing: GPSMAP 8417 allows you to share features with other compatible GPSMAP units such as radar, supplemental maps and user data, including waypoints, routes and tracks. You can also share images from Garmin VIRB® action cameras, GC™ 10 marine cameras and FLIR cameras. User data entered into 1 chartplotter can be automatically synced with other chartplotters in a network. Heading, Position Refreshed 10 Times per Second: Fast, responsive 10 Hz GPS refreshes your position and heading 10 times each second to make your movement on the screen more fluid. Now, it’s quick and easy to drop up to 5,000 accurate waypoints and find your way back to them. SailAssist Features: Supported sailing features include laylines, enhanced wind rose, heading and course-over-ground lines, true wind data fields and tide/current/time slider. Racing features include pre-race guidance, synchronized race timer, virtual starting line, time to burn and layline data fields. Gauge displays are designed to provide important, need-to-know information at a glance, including true and apparent wind angle, set and drift, true or apparent wind speed, horizontal or vertical graphs and a data bar with customizable data fields. Create your own HD maps: Quickdraw Contours is a free, easy-to-use software feature already installed on your compatible Garmin combo. It instantly creates your own personalized HD fishing maps with 1-foot contours. Tailor them to fit your needs. They are your maps — you own them. Keep the data to yourself, or share it with the Quickdraw Community on Garmin Connect™. There’s no special surveying expertise required. You just fish while it creates maps. You don’t have to wait around or send your files away like other mapping software requires — your results appear instantly. Use with any of the following sonar transducers: Garmin Panoptix™, HD-ID™ traditional, CHIRP-enabled, Garmin ClearVü™ or NMEA 2000®-compatible depth. Have more than 1 sonar device installed onboard? Quickdraw Contours automatically selects the most capable sonar device to provide the very best results for you! Upgrade to Our Best Maps on the Water: Add a Garmin Card Reader that provides convenient remote mounting and a single access point for 2 SD™ card slots for accessory map purchases such as LakeVü HD Ultra with MaxDef Lakes, BlueChart g2 HD or BlueChart® g2 Vision® HD, which add Garmin-patented Auto Guidance 3.0 and other great features. You can add multiple card readers for additional access points. Water resistant magnetic door allows card reader to be mounted horizontally or vertically (sold separately). FUSION-Link Entertainment System: Enjoy the ability to control all compatible FUSION-Link-enabled audio systems directly from your compatible chartplotter display. Built-in Connectivity: It’s easy to connect to peripheral devices with built-in Wi-Fi® connectivity, ANT® technology, 4 wired Ethernet ports, NMEA 2000, HDMI and USB ports with complete network compatibility. The Ultimate Connected Boating App: Built in Wi-Fi gives you access to the free all-in-one ActiveCaptain® app, so you can manage your marine experience from nearly anywhere. It creates a simple yet powerful connection between your compatible mobile device and your Garmin chartplotter, charts, maps and the boating community. Wherever you are, you’ll have unlimited access to your cartography, the ability to purchase new maps and charts and access to the Garmin Quickdraw™ Contours Community. Stay connected with smart notifications on your chartplotter screen. You can also plan a trip or prefish a lake, and ActiveCaptain will automatically sync with your chartplotter. Even get notifications for software updates, and decide when to download them on your device. Multiple Depth Range Shading: Designate up to 10 different depth ranges each with its own color. Makes it easier to view target depths at a glance. 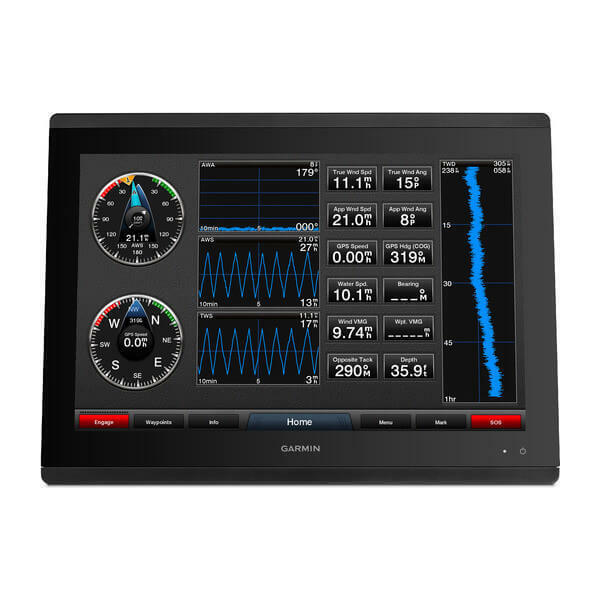 Commission Autopilot from Chartplotter: To make commissioning easier and more convenient, you can handle the entire autopilot commissioning process from your chartplotter screen. Axis and FLIR Camera Support: Garmin offers support for select Axis cameras and for select FLIR cameras. These can be used for surveillance and situational awareness on vessels of any size. You can control your camera's pinch-to-zoom and pan/tilt settings with gestures directly on the plotter screen and view video on multiple screens as well as multiple video streams on the same screen. Use an Axis encoder to convert analog camera, such as Garmin GC 10, to video over IP. Catch All the Action On the Water: This chartplotter supports wireless connections to Garmin VIRB® X and XE action cameras so you can catch all the action during your time on the water. More importantly, with a simple software update, you can control recordings, take still pictures, and stream video from a VIRB X/XE action camera to your GPSMAP® 7400/7600 series chartplotter or 8000/8400/8600 series Glass Helm chartplotter. In fact, you can stream video from up to 4 VIRB X/XE action cameras and view the video on a compatible marine chartplotter. You can even view previously captured images and videos on the chartplotter and display thumbnail previews for easy selection. Control play, pause, seek and replay from your chartplotter. There’s even an automatic slide show mode and the ability to delete unwanted VIRB images or videos. Each VIRB can be named for easy identification. You can also control your VIRB cameras to change VIRB video settings, including aspect ratio, video resolution, frames per second, photo size, field of view and more — directly from the marine chartplotter. Send NMEA 2000 boat information from the chartplotter to VIRB X/XE to be overlaid as G-Metrix™ data on the video using VIRB Edit or the VIRB mobile app. Some data requires optional accessories.